From Dover, Michigan, Paul Shepherd--formerly of Kansas Territory--writes James Redpath to pass along "some useful information, in repect to John H. Kagi." 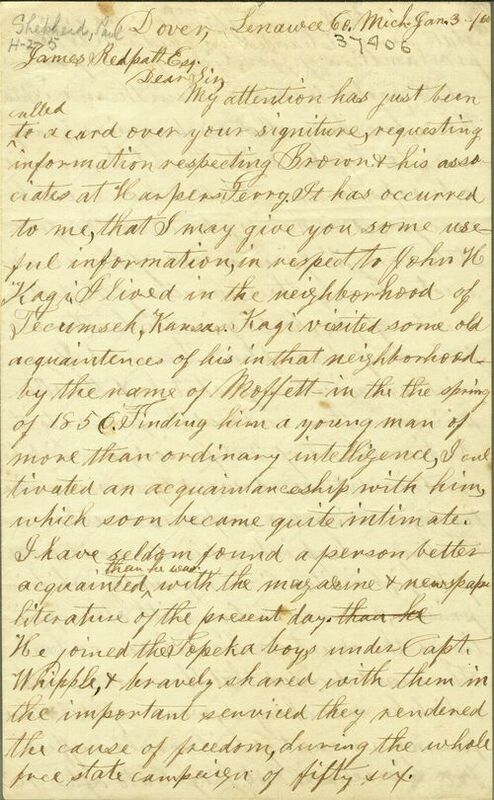 Of most interest, perhaps, is Shepherd's account of the "shoot out" at Tecumseh, Kansas Territory, between Kagi and Judge Rush Elmore, who Kagi had accused of "being a prime mover in the murderous attack upon him" at Lecompton, Kansas Territory, in mid-January, 1857.